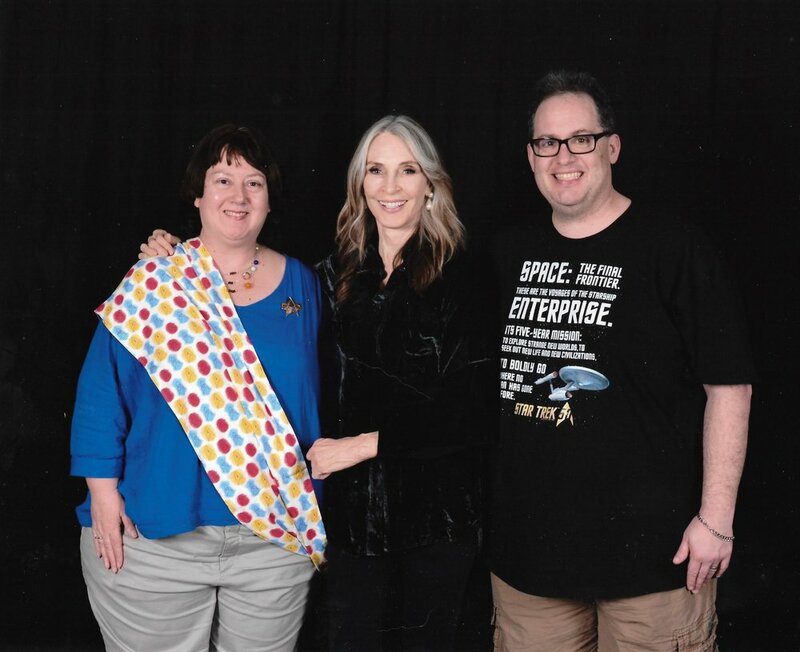 This was the 3rd year of Star Trek themed cruises, but our 1st year attending. I went in with low expectations of star interaction, but expected some fun shows and events and the usual cruise events we we're used to. We started our Star Trek cruise with a flight to Miami with a connection in Atlanta. 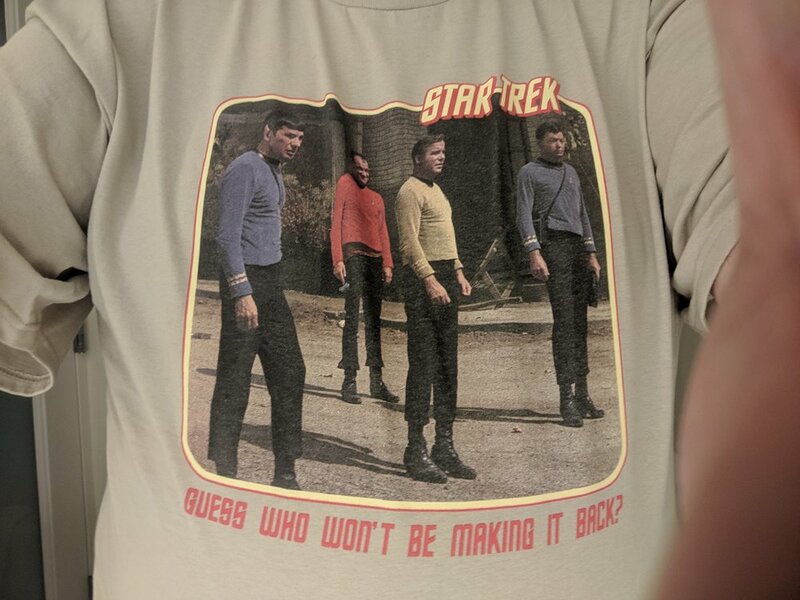 I started the trip in one of my many Trek themed t-shirts and other cruisers on the flight said hello. This was the beginning of the friendly attitude of almost everyone on the ship. We had arranged to stay at the main hotel associated with the cruise. After getting checked in we headed to look for some coffee and ended at the bar, and eventually it ended up as the meet up. As a regular con attendee this is no different. There were regulars who knew each other from previous cruises and social media that hugged and were quick to cluster. I was still pretty stressed and tired from the flight so we just people watched. We had a leisurely breakfast before the cruise line bus picked us up and took us to the loading area. It wasn't until we arrived at the loading waiting room and saw hundreds of Trekkers in various garb waiting to board that we realized — we're among our people. Our first meal on board was in the Grand Pacific ballroom, the fancier sit-down freestyle restaurant. We then found our room and unpacked, learned about emergency drills, and began to explore the ship. There was also a fun party where all of the celebrities jumped on stage and said a quick hello. We had a nice mini-suite with a big bed, large bathroom, and a deck. The sun deck on this cruise was not as crowded as our last cruise, so we did not feel the need to hide out on our own deck as much as we did then. 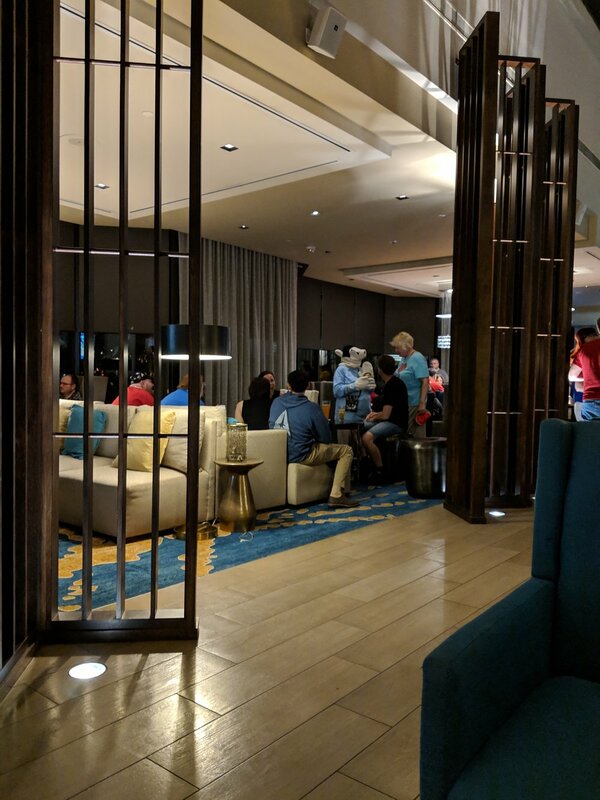 That evening we had two picture events with Trek stars — Gates McFadden, the Doctor from The Next Generation, who was very pleasant and chatting, and Robert Picardo, who played the Doctor on Voyager. Every evenings there was an event in the ballroom. Tonight's was an introduction of some of the cruises stars hosted by Jonathan Frakes, Riker and Michael Dorn, Worf - both on The Next Generation. They started the show with some fun banter. Frakes was surprisingly light and fun. They introduced Will Wheaton who told some stories about growing up on set and his enjoyment of music. This transitioned into his introduction of the musical guest Thomas Dolby. Best known for the song, She Blinded me with Science. It was pretty good. We were pretty exhausted after a full day even though there were plenty of late night partying starting. Plenty of people wake up early like me, and we had breakfast in the Garden Cafe. We arrived at the cruise line island and took tenders over. The seas were too rough for this visit on our last cruise. They were still pretty rough this time and made boarding the tender, which I kept calling a tinder, a bit treacherous. We found some shady chairs and took turns wading in the cool but comfortable water. I explored a little before we had lunch at the buffet. We made our way to the celebrity-led cruise with Max Grodénchik, Rom from Deep Space 9. As we sat waiting, Max arrived but so did some grey clouds and wind. Several cruisers headed for the tender but our event was not yet cancelled. Soon the rain started. Cindi ran for the nearby bathroom building and I took cover under the eave of the event building to maybe hear more from officials. The rain and wind picked up pretty hard. Soon me and my half dozen close friends under the eve were standing in rising water. I decided to dash to the restroom building and find Cindi. The rain cleared to light sprinkle after about 30 minutes. We decided to dash to the buffet area, to at least have some picnic tables to sit at. While there, who ended up at the table but Max and his family. We asked for a quick selfie, but he insisted on posing with us and his wife taking the shot. He then chatted with us for quite a while. The weather cleared so we made our way to he tender dock. After arriving back at the ship our line from the upper deck merged with the lower and I was standing next to Will Wheaton. I said hello and that I enjoyed talk from the night before. After security we jumped on the elevator and there he was again. On our way to dinner we bumped into Andrew Looney, the designer of Star Trek Fluxx, and his marketing assistant. They joined us for dinner and we sat with two others. Conversation turned to board games quickly, and Andy pulled out their card game Get the McGuffin. A fun game that worked perfectly as we waited for appetizers. We talked about some of the other games they had in development, as well as favorite Trek episodes. After dinner we had our photo with Brent Spiner. He was in high demand so the photo chatting was pretty brief. We found the newly opened Mirror Mirror Exhibit. This was a bunch of props and costumes from the alternate universe as seen on Discovery. I should probably comment on how popular Discovery was. Issacs, of course well known I nerd culture as Malfoy before becoming Captain Lorca, was a very popular guest star. DISCO shirts were very popular. One reason I may suspect is the LBGTQ friendly tone of the show. This was an extremely friendly cruise where everyone could be free to show their nerd fandom, sexuality, young and old, and any body type without any fears. There was a “Gaaaays in Space” group as well. We ended the night watching a dance party in the Atrium called go-go dancing with the Borg. Day three was at sea. It started with watching sunrise from our private deck as the ship passed by Havana. We had our formal photo with Wil Weaton. Since he is a board gamer, I switched from my usual Trek wear to a board gaming shirt. My wife had picked up a Wesley Crusher shirt in the gift shop the night before. As we approached he’s like “Oh my god, a Wesley Crusher shirt I’ve never seen…” Like most of our pictures, I was ignored. I ate breakfast on sundeck at the aft of the ship and checked out the game area near Quarks bar and hung out on the sun deck by the pool. This was our favorite morning hangout. A great place to catch some some and relax before the day got started. I had brought a few games in my quiver. I thought it was great that someone brought a bunch of Trek games, books and puzzles. There was a Next Generation discussion with McFadden, Wheaton, Frakes, Spiner, Dorn, Crosby, and Delancy. This was fun. All of the celebrity events were great. They ranged from yoga and tennis for the athletic, to game show events, music/dance shows, overall chatting, scenes, makeup demos, art demos, etc. We tried out the Asian themed Jasmine for lunch. Returning to Quarks with my quiver, we played some games together. I took a nap. Long days with late nights with catching up on me. That night, we had scheduled a dinner at the French-themed bistro after enjoying it in a previous cruise. We were dressed up because that night’s theme was gala, though that still included a ‘red shirt’. Like everywhere on the ship, they had Trek music playing. They did keep the French/Trek theme with some fun Quark art. As we were having our dessert, Casey Biggs, a Cardassian on DS9, sat next to us and leaned over, asking us what we had. Cindi ran off to get in a photo line and I got to say hello to Nana Visitor, Kira on DS9, coming in as I was heading out. Later I realized she may have been dining with Connor Trinneer, Tripp on Enterprise, but I was a little distracted by Nana and only said hello to her. I joined Cindi in the line to get a picture with Jonathan Frakes, who was as fun as everywhere else we had seen him. He often took on the role of Wheaton’s bumbling father figure, which created some fun moments for them together. His fill in role on Jeopardy! was a hoot. That evening’s show was a duet with singing Robert Picardo. Not Trek, just showing his singing skills that were often seen on Voyager. Having napped, we finally had the energy to stay up and join the late night party at “13 Forward,” dancing to a great band and enjoying the great costumes. I had another outdoor breakfast before heading to the Cayman Islands. These tenders were better than the day before. We did some souvenir and jewelry shopping before joining up with our “submarine” tour, which was fantastic. Finally an excursion that succeeded. I had a snow cone and some sort of local meat pie before taking the tender back the the ship. We had a quick lunch at the buffet and I got to rub elbows with John De Lancie, Q from The Next Generation. It’s not like we chatted or anything but it was still fun to bump into them on the ship as you made your way around. I had a massage to relax some tension I had in my neck from before the cruise. It was quite relaxing. Cindi ended up napping so I went to the Atrium to get a coffee and watched folks getting autographs. After dinner at Alizar we made our way get our previous days photos. Tonight's show was a Jeopardy game with Issacs, Wheaton and Frakes with the cruise director as host. Issacs is quite funny and sharp too. The band from the previous night was playing at the pool, so we joined the party and danced to a few songs. They had set up a fun buffet with carved fruit. Cindi slept in and I got up too early. Even though we had decided to skip Jamaica, since it was a dock port and I was awake, I headed out to explore. The area closest to the ship was very touristy shops so I headed I to the city of Falmouth. I was immediately greeted by people offering me personal tours, suggesting I enter scary bars, taxi tours etc. It was pretty depressed, and I headed back to the ship. Cindi and I played more games at Quarks and had a poolside lunch. 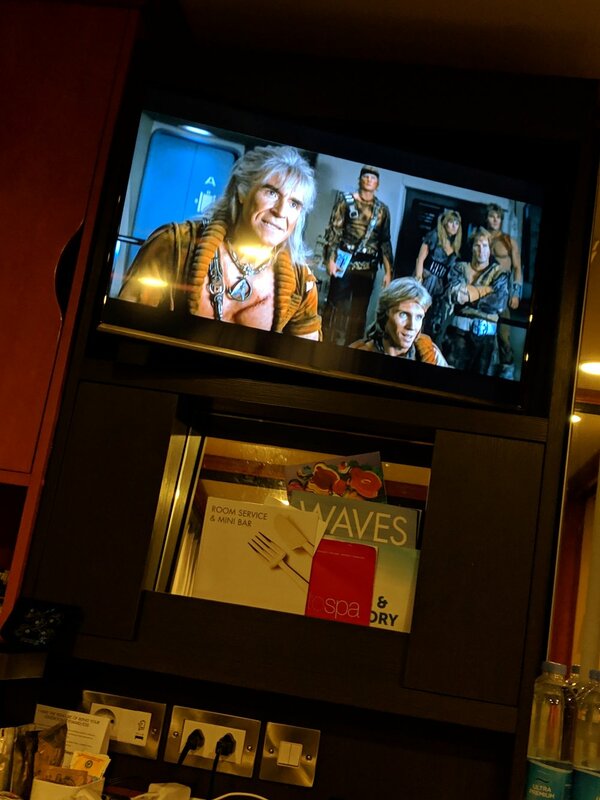 I took a nap and we watched some Trek TV while getting ready for dinner. Didn't mention yet there were always 2-3 channels showing a Trek movie or series episode available I your room. We had dinner tonight i the Kilingon Carnivora, a re-themed Brazilian steakhouse. Since tonight's theme was Q's costume party we went in costume. Cindi as Miranda Jones from the Original Series and me as Robin Hood from an Next Gen episode. The Atrium held the costume party/judging. The line was huge and the costumes were amazing. We jumped in the end of the line. Unfortunately our costumes, and the atrium, were really hot so we went to our room to put the AC on full blast and cool off. Hanging out by the pool. Hey, was that Thomas Dolby in the hot tub? Unfortunately we had to start to organize for packing. We sat in on a Wheaton event where he discussed various current events he is working on and took questions about growing up in Trek and mental health issues. Here is a pic of us about 10 miles back but still it was good to hear. This ended at an odd time when only place was open for lunch. Just about the only time we had to wait in line for something that wasn’t a picture with a star. We decided to see if there was anyone in the game area. I played some Rummy with some cruisers. Cindi joined me and we got to try out a Trek-themed prototype with the Looney Labs gang. I’m looking forward to seeing more from this game. We picked up our luggage tags and took care of some more packing. We headed up to the pool for some relaxing before Gorn gong show. This was a fun event to guests perform skills and silly skits and get judged by the celebrities if they didn’t first get gonged by the Gorn. We started to pack before dinner at Cagney's, the steak house. We then finished up packing before our last show. Spiner singing show tunes — he was surprisingly good. Not really my kind of songs, but he did a really good job. Pretty tired, we put out our luggage out for the pick up and called it a day. Since we were not in a hurry to catch a plane or anything we had a leisurely breakfast in the large dining room. Our tag color was called and we are off this ship in no time and were reunited with our luggage. We had rented a car in Miami for part two of our vacation, and caught the shuttle for that waving goodbye to the ship. The ship was decorated for the Trek theme. Most places had music from the shows/movies playing all the time. The screen in the pool area was a Borg cube. The elevators were all labeled Turbo lifts, and were decorated inside. Will I go again? I'm in no hurry. Plus, the next cruise is moving to a ship twice this size. Our last cruise was on a larger ship and it was crowded, this one was not and it was great that we got to know people and saw them several times. Lastly, as I finish this up, it has been four days since the cruise and my head his still spinning — I forget how negatively cruising impacts my inner ear more than most. It was great, no regrets and I would recommend it to anyone as long as they know what they getting into.